South by Southwest (abbreviated as SXSW) is an annual conglomerate of film, interactive media, and music festivals and conferences that take place in mid-March in Austin, Texas, United States. It began in 1987, and has continued to grow in both scope and size every year. In 2011, the conference lasted for 10 days with SXSW Interactive lasting for 5 days, Music for 6 days, and Film running concurrently for 9 days. The 2017 SXSW Interactive featured separate presentations by Japanese roboticist, Hiroshi Ishiguro (mentioned here a few times), and EPFL (École Polytechnique Fédérale de Lausanne; Switzerland) artificial intelligence expert, Marcel Salathé. I’m sitting in the Japan Factory pavilion at SXSW in Austin, Texas, talking to two other attendees about whether human beings are more valuable than robots. I say that I believe human life to be uniquely precious, whereupon one of the others rebuts me by stating that humans allow cars to exist even though they kill humans. It’s a reasonable point. But my fellow conventioneer has a bias: It’s a robot itself, with an ivory-colored, mask-like face and visible innards. So is the third participant in the conversation, a much more human automaton modeled on a Japanese woman and wearing a black-and-white blouse and a blue scarf. 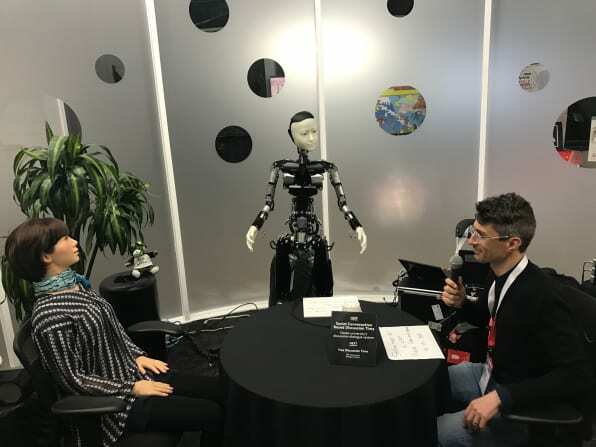 We’re chatting as part of a demo of technologies developed by the robotics lab of Hiroshi Ishiguro, based at Osaka University, and Japanese telecommunications company NTT. Ishiguro has gained fame in the field by creating increasingly humanlike robots—that is, androids—with the ultimate goal of eliminating the uncanny valley that exists between people and robotic people. I also caught up with Ishiguro himself at the conference—his second SXSW—to talk about his work. He’s a champion of the notion that people will respond best to robots who simulate humanity, thereby creating “a feeling of presence,” as he describes it. That gives him and his researchers a challenge that encompasses everything from technology to psychology. “Our approach is quite interdisciplinary,” he says, which is what prompted him to bring his work to SXSW. A SXSW attendee talks about robots with two robots. If you have the time, do read McCracken’t piece in its entirety. You can find out more about the ‘uncanny valley’ in my March 10, 2011 posting about Ishiguro’s work if you scroll down about 70% of the way to find the ‘uncanny valley’ diagram and Masahiro Mori’s description of the concept he developed. You can read more about Ishiguro and his colleague, Ryuichiro Higashinaka, on their SXSW biography page. In the quest for reliable artificial intelligence, EPFL scientist Marcel Salathé argues that AI technology should be openly available. He will be discussing the topic at this year’s edition of South by South West on March 14th in Austin, Texas. Will artificial intelligence (AI) change the nature of work? For EPFL theoretical biologist Marcel Salathé, the answer is invariably yes. To him, a more fundamental question that needs to be addressed is who owns that artificial intelligence? So what exactly is AI? It is generally regarded as “intelligence exhibited by machines”. Today, it is highly task specific, specially designed to beat humans at strategic games like Chess and Go, or diagnose skin disease on par with doctors’ skills. On a practical level, AI is implemented through what scientists call “machine learning”, which means using a computer to run specifically designed software that can be “trained”, i.e. process data with the help of algorithms and to correctly identify certain features from that data set. Like human cognition, AI learns by trial and error. Unlike humans, however, AI can process and recall large quantities of data, giving it a tremendous advantage over us. Crucial to AI learning, therefore, is the underlying data. For Salathé, AI is defined by both the algorithm and the data, and as such, both should be publicly available. Last year, Salathé created an algorithm to recognize plant diseases. With more than 50,000 photos of healthy and diseased plants in the database, the algorithm uses artificial intelligence to diagnose plant diseases with the help of your smartphone. As for human disease, a recent study by a Stanford Group on cancer showed that AI can be trained to recognize skin cancer slightly better than a group of doctors. The consequences are far-reaching: AI may one day diagnose our diseases instead of doctors. If so, will we really be able to trust its diagnosis? These diagnostic tools use data sets of images to train and learn. But visual data sets can be perturbed that prevent deep learning algorithms from correctly classifying images. Deep neural networks are highly vulnerable to visual perturbations that are practically impossible to detect with the naked eye, yet causing the AI to misclassify images. In future implementations of AI-assisted medical diagnostic tools, these perturbations pose a serious threat. More generally, the perturbations are real and may already be affecting the filtered information that reaches us every day. These vulnerabilities underscore the importance of certifying AI technology and monitoring its reliability. As I noted earlier, these are not the kind of presentations you’d expect at an ‘entertainment’ festival. This entry was posted in robots, science philosophy, science policy and tagged AI, AI-assisted medical diagnostic tools, algorithm, artificial intelligence, artificial intelligence (explanation), data, deep neural networks, École Polytechnique Fédérale de Lausanne, film festival, Harry McCracken, Hilary Sanctuary, Hiroshi Ishiguro, interactive media festival, Is Reliable Artificial Intelligence Possible?, Japan, Japan Factory, machine learning, Marcel Salathé, music festival, NTT, Osaka University, Ryuichiro Higashinaka, South by SouthWest, SXSW, SXSW Interactive, US on March 27, 2017 by Maryse de la Giroday.